Embroidered Table center by Ann Macbeth. The Glasgow Girls. Home » Embroidered Table center by Ann Macbeth. The Glasgow Girls. Embroidered Table center by Ann Macbeth. Embroidered Table center by Ann Macbeth. Art nouveau c. 1901. 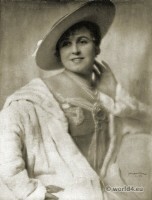 Ann Macbeth ( b. 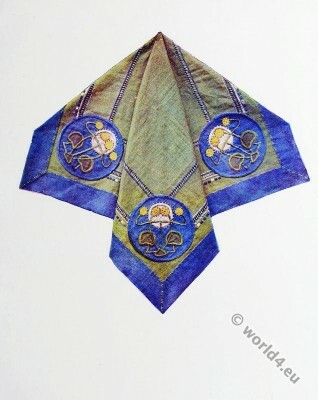 1875 Bolton – d. 1948 Patterdale, Cumbria) – Scottish artist and writer, master of embroidery and designer of Art Nouveau, a member of the art group The Glasgow Girls. 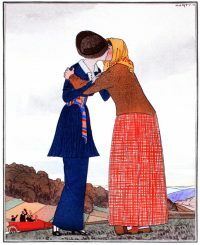 The Glasgow Girls were a group of designers and artists, all of which had visited the Glasgow School of Art and were now working as artists and their work made a significant contribution to the development of art and design throughout Europe and the United States. 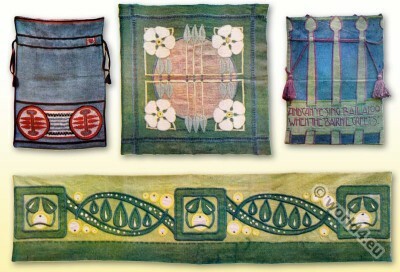 Embroideries by by Ann Macbeth. Ann Macbeth studied at the Glasgow School of Art, and in 1911 headed the Department of embroidery in this school. 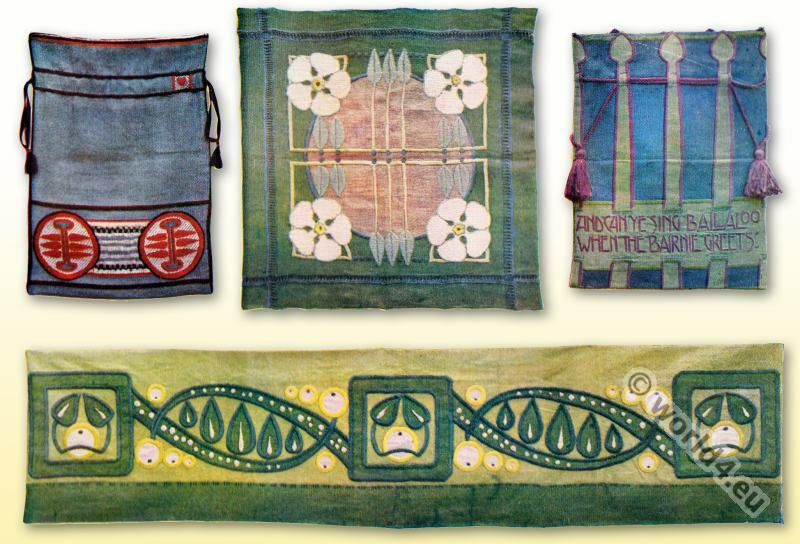 As a designer of fabrics she collaborated with artist Charles R. Mackintosh and his wife Margaret. For a long time Ann Macbeth works exhibited in the tea room of Mrs. Cranston (“Miss Cranston’s Tea Rooms”), which usually took place in Glasgow exhibition of avant-garde and modernist art of the early twentieth century. Macbeth performed design works for some companies to produce fabrics and clothes (eg for Liberty & Co); her embroidery adorn the Glasgow Cathedral. 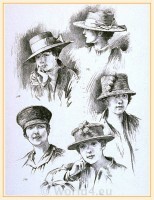 Ann Macbeth is the author of five books on art embroidery. Educational Needlework (released in 1911, Margaret Swanson), Needle weaving (1922), Embroidered Lace (1924), Countrywoman’s Rug Book (1926). The last 27 years of her life from 1921 to 1948, she spent in the small town of Patterdale, in the county of Cumbria. The local church of St. Patrick has a collection of her embroideries. 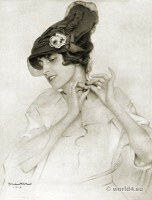 Fin de siècle era, Art Nouveau, Art deco, Flapper fashion. Sheath dresses by Hammer. Art deco fashion 1922. The opium smoker. The Bachelor 1921. Style dress by Herrmann Gerson. Art deco fashion 1922. Two Sisters - Evening Dresses January 1922. Art deco costumes. Queen of Spades. Hat and dress by Gerstel. Art deco fashion 1922. Les Robes de Paul Poiret racontée par Paul Iribe, Paris 1908. This entry was posted in 10s, 20th Century, Art Nouveau, Embroidery, England and tagged Artist, Embroidery designs on 8/19/15 by world4.